My intention is to be a source of guidance and information to the next generation of Acadians, not to exclude other seekers of the truth. If we get the past right, then the present will work itself out. There is great power in knowing who you are historically. The Acadians of South Louisiana especially, but also Acadians where ever we have been dispersed all over the world today, have been in the dark about our own history. Even what we’ve been given since the time of 1620 is worthless for those who want to know the truth. Without asking why no one was there to guide us, let us take up the mantel and start getting it right. I began this investigation when I decided to home school my children. After stocking up on about $200 worth of books at the local chain book store, and taking a good look at it all, I decided that something wasn’t right about the whole thing. Nothing makes sense about American official history especially if you are acutely aware of the Acadian history, as I am. It just so happens that the man called Beau Soleil in Acadian History is my great, great, etc….grandfather and the reason I know this is because my Aunt Camille Broussard spent a lifetime doing the research. She ran a Real Estate Agency and so was very comfortable making enquiries all over the world tracking down the records. She is the person that we should all credit for our Acadian genealogies. She worked out of a house in Loreauville which is very likely the house that Armand Broussard built and lived in. Armand was the last son of Beau Soleil, the one who stayed in Loreauville and ran what came to be an empire of that era, supplying cattle to New Orleans by driving and ferrying the herds live across the Atchafalaya. So I grew up right where Beau Soleil first set foot West of the Atchafalaya and when I look carefully at the records, they indicate quite a different story than the fairy tale of the Acadian ‘Expulsion’, which is a lie designed to distract us from the fraudulent ‘selling’ of the Acadian Forts that is what actually happened. The lies are designed to cover up the fact that all of the Indian tribes had finally converted to Catholicism and were allies of the French Catholics against the Pirate Protestant Puritans, wow they give themselves so many different names. This history is my own family history, with information derived from family sources and a unique perspective. However, the people involved in this series of events are all of historical significance especially in regards to American and early Acadian History. I didn’t want to pass on lies to my children so I set off on this investigation to verify all the claims made by official historians about what actually happened between the years 1600-1800 in America and in other places that affected the people here. I’m trained as an artist and educator which equips me to spot propaganda patterns, which happens to be a lifetime interest of mine. I’ve worked in advertising, as a writer, political lobbying and I’m a professionally trained artist with an expert eye for visual anomalies. The nature of the falsified historical narrative is such that a good eye for fakery is needed. I’m passing on my notes to other educators who also don’t want to be guilty of passing on lies to the next generation. I don’t get paid for this and it’s very tiring and time-consuming but I’m offering this work in reparation for my sins and for the merit of the poor suffering souls in purgatory. I dedicate my work to the Immaculate Heart of Mary, and look forward to the day when her existence as a motivating force in history and her apparitions especially are included in everyday curriculum in the homes and schools of Catholics. I hope to be able to offer a printed book with artwork reproductions and music CD as a teaching aid for Catholic homes choolers, and this website is a tool for me to organize my notes and mull through the vast amount of material that I’ve gathered. Please feel free to contact me if you are interested in supporting and being a part of this project. The other advantage of these notes is the opening up of our history to the infinite past, rather than continuing with a shut door before 1600, which is the result of believing the lie that the Acadians were ignorant peasants. Whoever wants to continue believing that myth won’t find any support for it here. There is an enormous history of Catholicism in Europe and beyond that is our history in an intimate way. It involves people from whom we descend. As to Christendom itself, as the place was once called, we aren’t even told it ever existed. It languishes unrecognized and maligned because no one else has the right to claim it but us. Should we so invest our identities in the ‘ignorant peasant’ paradigm that we allow our own true artistic, religious and literary heritage to be ignored, un-translated, unread, unsung, unseen. Should our entire musical heritage be limited to the brief period in which there were few instruments and people were migrating? What about all the years before that? Someone was singing Gregorian chants and inventing pianos in France…do you think it was the English? Our present school curriculum blinds us to the plentiful evidence that our Catholic heritage is rich. It’s forgotten, but it’s still there. The very libraries in the major centers of Europe are those of the Catholics, people on our own family trees, with their images and their lives recorded there, waiting to be copied and disseminated to the next generation of ‘Acadians’. My research reveals that these are all our very own ancestors, and the names prove it. From a tribal and national point of view, no one has to prove that they descend from any particular person within the group, in order for us all to recognize that it is our group. It is our history, no matter how you connect to it. No one has to prove royal ‘lineage’ to claim the history as our own, though it’s not unusual to find a royal connection. Common sense tells us that we can return the Catholic continuum to our historical narrative within the classrooms if we choose, and that we should. We can make it part of our normal twelve year education to point out our tribal place in the events of the past, all the way back to the Roman Empire. All that need be done is to include all the events going on while there was no war, to bring the Catholic Church back into the historical picture, along with the individuals who steered that Ship for 2000 years, and to thereby change the historical perspective to one that looks out from our own eyes, not those of a group who call themselves ‘Puritans’ and ‘Protestants’ who are the avowed enemies of the Catholic Church and so choose to ignore it. The falsification of science is another topic that will be dwelt upon on this blog, and the connection that this falsification has to the Catholic Church. The surprise is that the in regards to science, Catholic Church teaching was correct all along, and this connects to falsified events that are shown to us on television and fake photographs of the earth from “space”. For those who are working on their own genealogies, there will be information here that can link up our genealogies to names and events recorded in church charters and other religious documents and engraved monuments. I sometimes weave this information into the daily topic. In twelve years of required schooling, our textbooks manage to leave out about 1500 years of Catholic and Orthodox history and art, and I hope to begin the process of correcting that fault for those whose heritage this is. Possible portrait of Joseph Broussard de Beausoleil. He is identified as one of the governors of the Dauphin. The Dauphin is the son of the King, next in line for the throne. This portrait might also be the father of Joseph and Alexandre Broussard. Research on this topic continues unabated and undeterred, despite all obstacles. I hope to post more information on that bloodline very soon. That drawing is a drawing of Jean De La Barre, Comte de’ Etampes. Lieutenant General of Paris, 1526-1534. 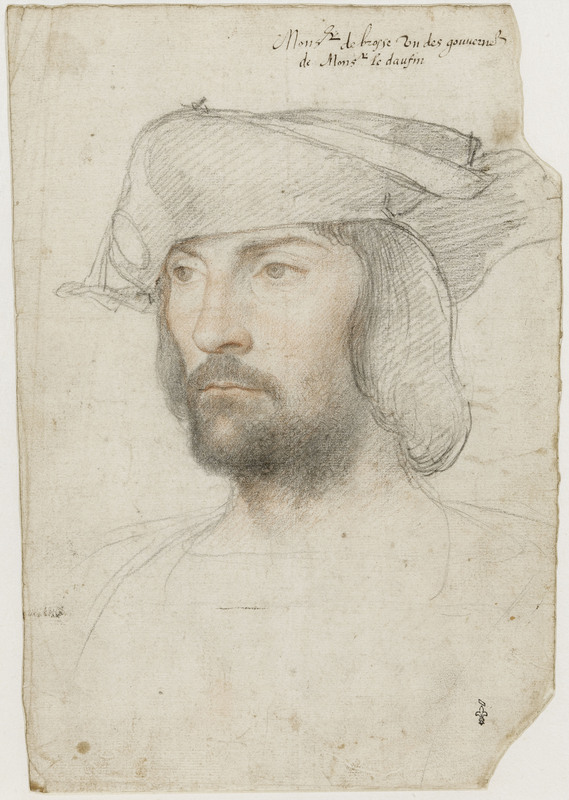 It was drawn by Jean Clouet, 1480-1541. I looked it up on the internet! Turn your attention to Scotland. Funny, that is exactly what I have been doing, turning my attention to Scotland. I would like to know the source of your information about king David. I am more interested in tracking down King Saul, because that is the hidden story in the bible and David’s reign just may be one of the original hoaxes, but I could write a book on that subject and Scotland is the key. Happy researching, and please share your sources and links so that I can check this out. Suzanne, I have given considerable attention to your writings the last few days and I want to say that you are very interesting. A part of me wants to say I Love you. Your tenacity and fearless intrepitude stands forefront in your writings. I rarely give links as I am the link. Quote me or dismiss me. I have spent decades uncovering truth;If I say something unbelievable, why would a link make me any more believable? I have tried to tell people what a Berth (birth) certificate is, What a DELIVERY REALLY is ( abandonment- thus the STATE takes ownership of the baby)what a DRIVER is, what a PERSON is, what a LICENSE is, what a HUman is,( Monster) what a CONSTITUTION is,( contract)what LORD really means,(BAAL) what AMEN really means ( AMENS:Total insanity ) What an INAUGURATION IS. ( Socerery) what CHRISTIAN really means ( Sun is GOD Crios=Sun, Ia= Jah,yah and ‘n or properly NA = BELONGING TO. Thus Anna ‘na Dannl means Anna wife of Dannl. And I have learned over these years that the education it takes to be thus educated is an education which must be fired in us from another, outer source. INSPIRED – breathed into us. When I get back to my story, MY MEMOIRS OF MARS I will spend more time enhancing THE Library in the Story. I see you read THE RHYME OF THE RUNIC ROUTE part einz. It is a part of the experience Michael B. ( MACCABEE) Bradshine has in my story ( MICHAEL B. AND THE PRISONERS OF NAGA) YOU CAN READ ON MY WP site or you can Google Michael B. Bradshine and read the story. It all ties in to the MEMOIRS OF MARs and actually the MEMOIRS is chapter one. Sanwarset might be the Egyptian version of Somerset. His face still exists in sculpted form. Although Egyptian is what we call these people, they also trace to Tibet and this history is hidden in Sikh history as well. In fact, what is called Egypt in the Old Testament Bible could be the land we now call America, and the Red Sea could have been the Salton Sea that existed in what is now the desert West. The point is that we just don’t know for certain where these events actually took place. Just something to keep in mind when reading the Bible, because Montezuma could as well refer to Moses’ Uma, the family of Moses, and there are many similarities such as this. The thing to remember is that two of the twelve tribes, Benjamin and Joseph, split off before the time of Mose, and these two brothers formed the Hellenic tribes.